These scones, these knobby specimens far removed from any thought of dainty, came to be through the generosity of an aunt by way of my parents. It started with their cranberries. My folks had returned home from a recent trip and, not ones to come back empty handed, I was handed a bag of dried cranberries. They'd been to British Columbia, they'd seen my aunt and uncle, who, I'm told, have these local cranberries with their breakfast most mornings. The berries were large and not particularly dry; less like raisins and more like large, flattened rounds, slightly cupped. The first comparison that came to mind was a berry version of orecchiette, the concave pasta with a fingertip-sized indent, but imagine them bright crimson and made of fruit. These were were plump and full of juice, and as they were only barely sweetened, the tart, lip twisting sharpness of the cranberry remained. I ate a handful on the spot. Benjamin did too. Then Mum and I got talking and we settled on making scones. Scones aren't new. Scones aren't innovative. Or trendy. Scones are a soft spot for me though, and my Dad and Mum too. 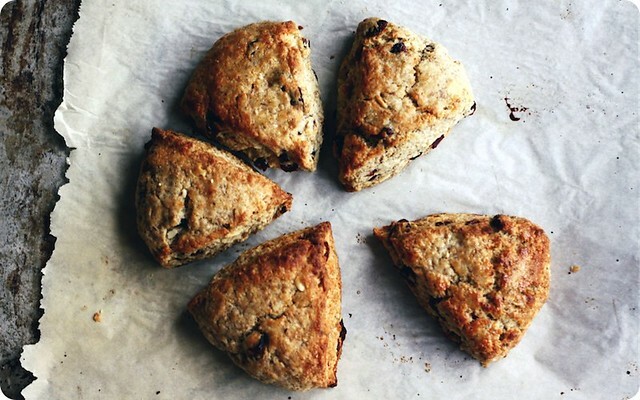 Scones are here, here and here already. And so, if I start nattering on about scones, you'll most likely know what I'm going to say because we've talked scones before - about their tender substance, the intricacies of their crumb - but there's a familiar sense of ease in that, in those known phrases and anticipated tastes. I will say, at their most rustic as these are, scones involve straightforward skills and little more. Bring together your flours; a mix of flours here to bring a subtle interest, but nothing too challenging for a Sunday morning. Cut butter into that flour with knives or fingertips, then add the buttermilk with the most indolent of stirring - lumps are fine, and long as the flour is pretty much dampened and beginning to clump together. Bring in the cranberries and nuts with a few turns of the spoon. If even that level of industry feels monumental, and I don't blame you as this is the route I took, use a stand mixer instead. On its lowest setting the mixer will gently distribute the butter and incorporate the buttermilk; freeing you to sip your coffee leisurely, with no greater task than occasional peek into the bowl to make sure things are progressing nicely. Either way, the ramshackle dough gets tipped out onto a board, kneaded briefly and patted together into rough and tumble disks. Slice the rounds into triangles and they're ready to bake. For those looking for extra credit, stir together a spoonful of sugar with the same amount of fresh lemon juice and, there, you've made a syrupy glaze to brush atop the par-baked scones. In the oven, this scant gilding will go from sticky to glistening, seeping in some cracks but mostly giving the scone's surface a crystalline makeover. It's an edge of sugared tang before the nutty, mellow wheaten sweetness of the crumb beneath. It's not necessary, but it's a nice bit of fuss. I made these the morning after our visit with Mum and Dad, in the sober quietness of the cool, blue hours before light touches the windowsill. That muted glow cast by the day's beginning felt the natural companion to a scone that was homey, reassuring. A feeling not unlike a good conversation with those you missed, after a time apart. There's a pair of links to share today. First, a heartfelt thank you to Babble.com for selecting this site as one of their Top 100 Mom Food Blogs for 2011. It is an honour to be in such company. And my friend Jess wrote this poignant post on her site, Sweet Amandine. It's a special one. She's got a restrained honesty as she figures out "what feels right" for right now. I thought I'd point you in her direction as I think it's not one to miss. A happy day to you all. Our dried cranberries were markedly less sweet than the raisin-like ones sold in many grocery stores. Using the latter style might warrant reducing the granulated sugar to a 1/3 cup. With inspiration from the Buttermilk Scones from Susan Fenniger and Mary Sue Milliken. To make the glaze, stir together the sugar and lemon juice in a small bowl. Set aside. Preheat oven to 400°F (200°C). Use parchment paper to line a standard baking sheet and set aside. In the bowl of a stand mixer with the paddle attachment, combine the flours, sugar, baking powder, baking soda, salt and lemon zest. On the machine's lowest setting, cut in the chilled butter until the mixture resembles course meal. The butter should be in small pieces approximately the size of peas. Mix in the cranberries and almonds. With the machine still on low, slowly pour the buttermilk into the flour and butter mixture in a thin stream, stirring until just combined. Use only as much buttermilk as needed to bring the dough together - don’t worry if you don’t use it all, or if you need to add a tablespoon or more. Small bits of butter should still be visible, but almost all the flour should be incorporated. Turn the dough out onto a lightly floured surface. Working quickly, gently knead the dough, folding and pressing gently until it just holds together. Divide the dough into two, and shape each ball of dough into a 6-inch round about 1-inch thick. Cut each round into six wedges, and place on the prepared baking sheet. Bake scones in the preheated oven for about 12 minutes, then carefully pull them out and brush the top of each lightly with the glaze, if using. Return the scones to the oven and continue to bake until the the tops are lightly golden and the cut sides look flaky and dry, around 5-8 minutes more. 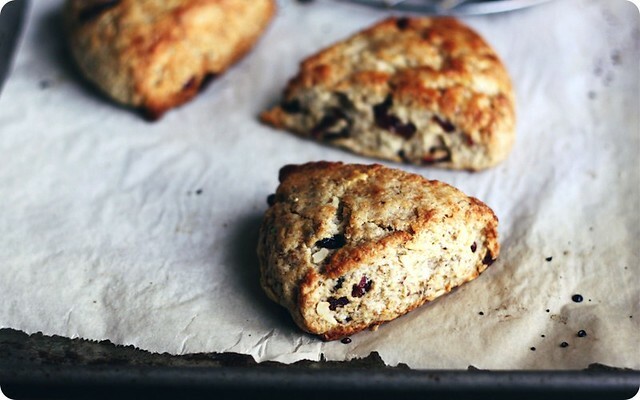 When fully cooked, the scones should feel light for their size and sound almost hollow when tapped underneath. Cool on a wire rack for at least 5 minutes. Best served warm the day they are made, but can be toasted or rewarmed in a low oven. Store in an airtight container at room temperature. In lieu of whole wheat flour, toasted oat flour also works quite well. To make your own, spread 3/4 cup of rolled oats on a baking sheet and bake in a 375°F oven until lightly golden, stirring occassionaly, around 7 minutes. Allow to cool, then grind in a food processor into fine meal. I would like to try these using whole wheat pastry flour and 1/2 cup of butter. I'll be sure to report back. This recipe can, of course, be done by hand using a pastry cutter or a pair of knives and a spoon. 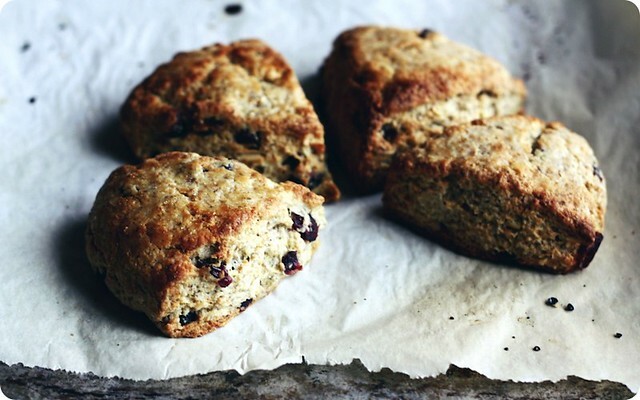 I've also had great success using a food processor for scones; the method for both is here.